When we help people who are living with dementia to bring their stories back to life, we give them the opportunity to be generative again, to give these stories from their lives back to their immediate communities, and to their families. When we began creating short stories for people living with dementia to read aloud, we were surprised by the journey that this simple exercise created. As people living with dementia began reading our prepared stories, they started telling us stories from their own lives. These stories really grabbed us, and we began writing them down. It is often said that everyone has at least one good story in them, and we have found this to be true. We are not talking about autobiography and we are not discussing life histories, but rather we are talking about incidents, fleeting moments from a person’s life that they share with us. For example, there was Virginia’s story about how she met her husband. He was the brother of a girl that Virginia worked with in a factory during WWII. He was in the Navy and was home on leave when Virginia went to her friend’s house for dinner. We took one look at each other and it was ‘bif, bam boom! They were married before his leave was over and he had to go back to the Navy and to the war. He survived the war and they were married until his death, some forty years later. This was just a brief moment in Virginia’s long life, but of course, a seminal one for her and for her husband. Virginia began to grow agitated and we thought that perhaps this was a mistake. But then, as she began to listen to the old woman talking on the TV, Virginia became engrossed in the story. She began to agree with the old woman, and shake her head yes, that was right. She laughed out loud when the old woman on the TV said that it was ‘bif, bam boom,’ when Virginia met her husband. “You are not going to believe this, but I was on TV today. I had my own show on TV!" When we realized that some people who have dementia can still tell stories from their lives, we began documenting these stories in print and on film. We learned that it was very important to first give people something to hold in their hands in order to prime the pump of memory. For Virginia, we happened to be visiting on Veteran’s Day and we just happened to give her a little flag that had the Navy insignia on it. She recognized the flag and that was the prompt that opened the gates to her story of how she met her husband. Now, we deliberately bring in meaningful objects or photographs from people’s lives to help give them some context for sharing stories from their lives. Finally, there was the love story that was told to us by a highly regarded scientist. He had taught in a major university and conducted important research that had an impact on world wide crop development. Knowing his life work, we brought in small galvanized buckets of different types of grains for him to put his hands into, to feel the grain again, to prime his memory of the years that he researched and worked with arable crops. As often happens to us in this work, Philip completely surprised us by his response to this grain exercise. He happily plunged his hands into the buckets, letting the showers of grain slide through his fingers. His eyes took on a dreamy look as the grain fell from his fingers back into the bucket. Then, to our amazement, Philip, the scientist, began to tell us about his one great love, the girl who got away, the reason he never married. Philip met her when he was working for the government in Washington D.C. When he began to describe Sherry, his whole physical being changed. 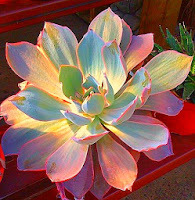 His face turned bright pink, his eyes brightened and his breathing came in rapid breaths, as though he had been running. He never told us why they did not make a match of it, he only told us of his great love for her and of her personal loveliness. We thought that by bringing in buckets of grain, Philip would tell us a story about his work in agricultural research, but instead we learned of his great love, Sherry. He said her name over and over again, with a dreamy smile on his face. It was a wonderful experience to see this great man of science talk about his one and only love, Sherry, the girl who got away. Stories are how we frame the scenes from our lives; it is how we remember our lives. People living with dementia obviously cannot remember their lives chapter and verse; they may be confused as to what era they are presently living in, or they may not remember events in the correct sequence, but there are scenes, moments from their lives that can be brought back to life. We know that the people telling us these amazing stories may not remember us for long, nor remember the stories they have told us; but we will never forget them or their stories. These stories bolster our belief that people who are living with dementia have so much to teach us, so much to share with us of wisdom and joy and heartache and fortitude. When we help people who are living with dementia to bring their stories back to life, we give them the opportunity to be generative again, to give these stories from their lives back to their immediate communities, to their families and to the larger world. Tom and Karen Brenner are Montessori Gerontologists, researchers, consultants, trainers and writers dedicated to working for culture change in the field of aging. 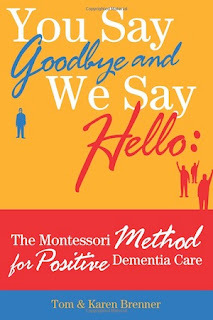 They are the authors of You Say Goodbye and We Say Hello: The Montessori Method for Positive Dementia Care.